Campus agriculture education: educating food citizens or producers? Colleges and Universities around the U.S. have quietly invested in campus agricultural projects (CAPs) as interdisciplinary space for sustainability and food system education. In 2009, the College Sustainability Report Card showed that 29 percent of college campuses had some sort of campus farm or garden (Sustainable Endowments Institute, 2009). Agricultural education is no longer limited to traditional land grant research farms. CAPs have emerged in small and large, vocational and liberal arts institutions; but what role do these programs truly play in educating future farmers and food system professionals? Is preparing students for a career in the food system a goal of the relatively young campus agriculture movement? If so, what are the educational objectives and the pedagogical process for achieving them? Using qualitative and quantitative analysis of a regional inventory and a national survey, this article explores the themes associated with the campus agriculture movement and calls for a greater focus on the direction and purpose of campus agricultural education. 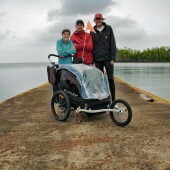 We are three friends who ran 1,352 miles around Lake Superior on an expedition that began in May and ended in August 2016. ​As we undertook our expedition on foot we not only aimed to collect water samples for a global microplastics initiative by the environmental non-profit Adventure Scientists, but also to sit down and capture the stories of people who dare to carve out a living on Lake Superior.